A Grave Situation. At least with regards to other historic cemeteries, some effort was put forth to show respect for the buried dead. In the case of El Campo Santo, restoration. For the other cemeteries, re-interment into suitable locations. Calvary was the epitome of how not to treat the dead. Originally drawn up as a side by side five acre section of Catholic and Protestant burial space (10 acres total). Protestants refused to bury their dead next to a Catholic cemetery. The protestant section became a park while the Catholic section remained open for burials. The demise of Calvary was rooted with the opening of a new Catholic cemetery “Holy Cross,” in 1919. Neglect and lack of funding during the great depression was briefly deterred by New Deal W.P.A. funding. During that time a grounds keeper was hired, and an adobe wall was erected to keep vandals out. Despite the best efforts of local individuals the cemetery fell into a state total disrepair. The last “Known” burial occurred in 1960. Raising the Dead; 1968 The city of San Diego steps in, to declare the cemetery, abandoned. The following year all head stones, and markers were razed and discarded into a ravine behind Mt. Hope Cemetery. Public outrage followed several publicized photos of the remains of the headstones. The only known public mass grave of head stones took place at Mt. Hope Cemetery. Two monuments were erected as well, one at Pioneer park, and the other at Mt. Hope. Some of the bodies (paid by the surviving family) were re interred in other cemeteries. The majority of bodies still remain under the lush green park grass. The exact number of bodies varies by who one talks too. This over lay shows near exact known burial locations. Ghost and spirits seek redemption. 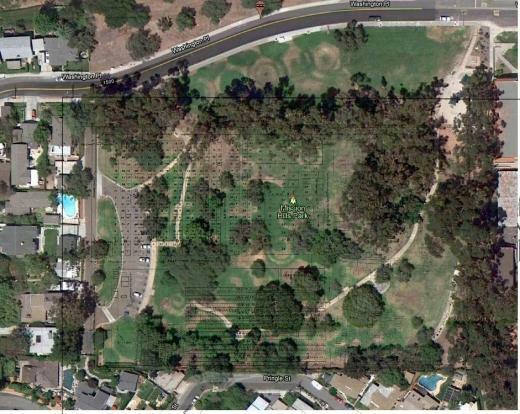 Is of little surprise that Mission Hills Park is supposedly “very” haunted. Oral History presented by pioneerpark.net by Valerie Goodpaster. Recounts urban stories from her youth about a ghostly lady that supposedly would rise from a grave. 3 Responses to "Mission Hills Park Calvary Pioneer Memorial Park aka Pioneer Park cemetery ghost haunt"
Julie Warren, who bought a home in 1973 abutting the park, said the only creepy experience occurred for about a month last year when her radio turned on by itself in the middle of the night and cranked up the volume to full blast. “We never knew what was causing that,” she said. Otherwise, she said she enjoys the family activities that take place in the former graveyard. My Ancestors who once lived in old town when it was still Mexico and then became part of the U.S are buried there their name appears on a plaque but no one in the family knows exactly where but it is some where in the park it would have been on the catholic side for sure. I am currently researching records at the history center to see if I can locate anything but so far no luck. All I know is that my great Grandmother used to go to the park look at the park and cry because she did not know where they were buried. In my endeavor to research family members I came across the name of (Pioneer Cemetery, Mission Hills). I think this is in San Diego, County, California. Would some one care to give me any idea where this is, As I am looking for family in the 1850 to 1860 time frame.